The Toronto Argonauts have signed a lease agreement with the Rogers Centre through Dec. 31, 2017. The CFL team has the option to terminate the deal earlier if they so wish. Chris Rudge and the Toronto Argonauts are on the clock. On Friday, the Argos and Rogers Centre announced they've signed a lease agreement through Dec. 31, 2017. However, the deal won't be renewed past that date, meaning the CFL club must find a new home field in time for the 2018 season. Or sooner. The Argos have the option to terminate the deal earlier if they want. "Yes, there's a deadline but it's not an unreasonable deadline," said Rudge, the Argos president and chief executive officer. "We could take a year to make the decision [regarding new home] and two years to put it up and still be in good shape while also having the option to move out early. "While we don't have any definitive plans we could share with anybody yet, it's our hope within six months to a year there will be something that's clearly definitive." Paul Beeston, the president and CEO of Rogers Centre and baseball's Toronto Blue Jays, didn't immediately return a telephone message Friday. But in a statement, Beeston said the agreement helps both parties. "The length of the deal allows the Argonauts a reasonable period of time to pursue other stadium options while allowing us sufficient time to plan the logistics of various stadium improvements including the installation of a grass playing surface for baseball at Rogers Centre," he said. If it takes until 2018 for the Argos to land a new home, they could be christening the new digs under new ownership. Senator David Braley, 72, who owns the Toronto franchise as well as the B.C. Lions, said he plans to sell one or both the clubs by the time he turns 75. "I do not anticipate owning two football franchises by the time I'm age 75," Braley said Friday, adding if he's still healthy he'd be open to keeping one of the teams three years from now. Of the two franchises, Braley would not only have an infinitely easier time selling the Lions but he'd get a better price for the club. B.C. is a perennial contender on the field, has solid attendance and corporate sponsorship and is on sound financial footing. Friday's announcement wasn't surprising as Rogers Centre informed the Argos over a year ago it was looking into installing a natural grass field that couldn't be reconfigured for football. The new agreement not only paves the way for Rogers Centre to make the switch to natural grass but ends years of speculation regarding the Argos' future at the domed stadium. The Blue Jays are just one of two teams in the majors not playing on grass and the organization feels it must make the switch to continue being able to attract top talent. New facilities are the trend in the CFL these days. The Winnipeg Blue Bombers are in their first season at Investors Group Field while the Hamilton Tiger-Cats will move into a new venue next year. The expansion Ottawa Redblacks are slated to return to the CFL in 2014 in a remodelled Frank Clair Stadium while in '17 the Saskatchewan Roughriders are scheduled to move into a new open-air building to replace Mosaic Stadium. The Argos have called Rogers Centre home since '89 when it opened as the former SkyDome. Playing in a dome certainly offered CFL fans protection in inclement weather but there has always been criticism over the lack of atmosphere in the facility, especially with the roof closed. Rogers Centre has a capacity of 50,000-plus fans for football and rocks when it's full. Trouble is, Rogers Centre can be cavernous when the fans don't come out and while the 7-4 Argos are atop the East Division, they're averaging just over 21,000 per game. "It's no secret many people would say the greatest impediment to us being more successful in drawing bigger crowds is the nature of that stadium," Rudge said. "It's not as intimate as football fans would like and we're probably better off trying to find a better place." Although the Jays and Argos have co-existed at Rogers Centre for years, it's often been a struggle for the CFL team to draw a favourable home schedule there. 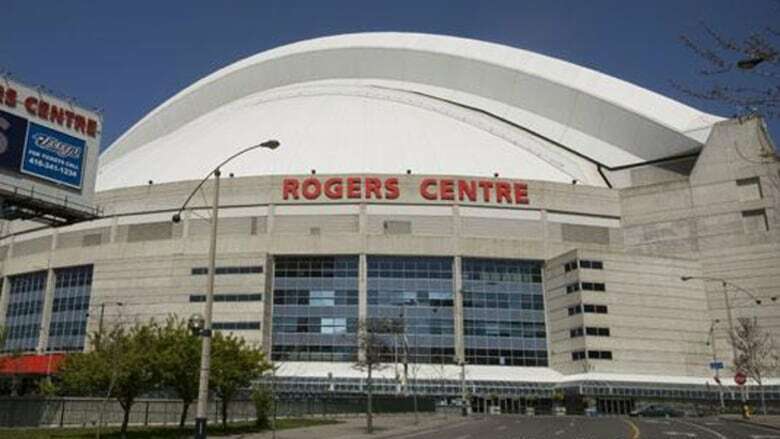 Rogers Communications Inc. owns both the Jays and building so often baseball takes priority. With the Hamilton Tiger-Cats' new stadium under construction, there was an opportunity for Toronto to host their arch rivals in their annual Labour Day showdown. But the Blue Jays were at home that weekend so the stadium couldn't be reconfigured in time and the Argos ended up playing a rare Tuesday night game the day after Labour Day. And with Rogers Centre being a multi-purpose venue, the Argos also faced competition from outside sources for their home dates. The Argos' most logical option is BMO Field, home to Major League Soccer's Toronto FC. The outdoor venue has a seating capacity of roughly 22,500 for soccer but can handle up to 28,000 for special events like concerts and provides an intimate setting. But there are still challenges there. Reconfiguring BMO Field would be an issue because it's not designed to accommodate a Canadian football field, which is 150 yards long (including two 20-yard end zones) and 65 yards wide. Toronto FC's loyal fans have also made it clear they don't want to share their grass field with a CFL club. But Toronto FC's owners are looking at whether BMO Field can be refitted for football. Tim Lieweke, president and CEO of Maple Leaf Sports & Entertainment, has said the organization is examining all options to improve the facility — including the addition of a roof — but no changes will be made that negatively impact the soccer fans' experience. There are also concerns a football team playing at BMO Field would cause serious damage to the playing surface, though the facility has hosted rugby contests without incident and the Argos have their own practice facility in Mississauga. Rudge said the Argos have talked with MLSE about BMO Field and hope to continue discussions, but he added that the club has other options. A CFL source said four municipalities have expressed an interest in accommodating a new stadium for the CFL franchise. The ideal facility would be an open-air venue with a seating capacity of 29,000 and available parking for some 10,000 vehicles while being accessible via public transit. "It's $150 million, ballpark, to do a stadium," Rudge said. "It probably requires an investment or partnership with multiple layers of government, a multi-use kind of investment in lands so you could amortize the costs of the stadium across commercial and residential investments as well that give you a better payback. "There's also being close to GO trains, subways and major highways while being accessible to public transit and having ample parking. All of these things have to be taken into consideration." If the Argos set up shop in a new facility outside of Toronto, Rudge understands there will be those who criticize the team for leaving the downtown core. "There are others in this argument who say, 'Well do you want to lose the excitement of being downtown,"' he said. "Probably not but I can tell you I look forward to losing the lack of excitement by walking in and seeing not as many fans there as I think our product deserves. "We said a couple of years ago when I got involved here we were going to invest in the product on the field and I think we've worked hard to create a team that's giving the city some excitement. Certainly, last year we knocked it out of the park in every respect and it still hasn't resulted in what we would've liked to have seen in season tickets this year."